I really need some help. I bought a new puppy (he's only 10 days old) and, as winter has recently begun, he cries and feels cold. Please suggest something to me to help him feel warmer and stop crying. Second thing, I am a working girl so there is no-one at home to take care of him. I usually take him to the office with me but gradually he is growing so please guide me to teach him to stay at home without me. Can you also suggest some ways to keep him busy please? 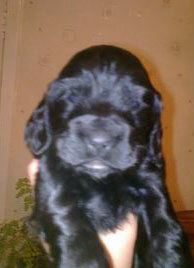 A puppy of 10-days old really needs to be with his mother and his litter mates. A puppy so young won't yet (and shouldn't) be weaned from his mother. Did you mean 10-weeks old? I hope so. My advice is based on your puppy being 10 weeks old, and is as follows. Your new puppy will be very lonely on his own all day long and should be let outside every hour to do his 'toilet' otherwise he will do it in your house and it will be very difficult for you to toilet train your puppy. I strongly recommend you buy him a crate if you can afford it and teach him how to use it. If you're unfamiliar with dog crates and don't know how to train him to use one, you can learn more about crate training your puppy here. If you can, I recommend that you continue to take him to work with you, and keep him in his crate while you work. Put in a couple of toys, some water and a warm blanket. He will feel safe in there. You can then keep an eye on him and take him outside to do his toilet. Please make sure you have him on a lead when you take him out otherwise he may run off and hurt himself. It's also advisable to make sure that he doesn't go on any ground where other dogs have been until he's fully vaccinated. If your puppy is not yet fully vaccinated, please discuss this with your vet urgently. If you cannot take him to work with you, I would still recommend a crate, but don't lock him in - 8 hours is far too long for any puppy or dog to be locked in a crate. Leave the door open. It's best if you put your puppy (and his crate) in a small room with a tiled (or washable) floor. Don't give him the run of the house otherwise you'll regret it as he'll probably do his toilet anywhere he chooses - perhaps even on your bed!! If you restrict him to one room then you will be able to manage his mess better. Place some newspapers on the floor in the corner of the room, preferably by the door and encourage him to go on the paper. Please read this article on potty training - it will give you all the information you need to help toilet train your puppy. If you do need to leave him at home, alone, consider leaving a radio on for him so that he can hear human voices. Would you be able to get home at lunch time to let him out for a little playtime and toilet? Or is there someone that you trust that could look in on him during the day? If your puppy is left alone for too long he may get bored and become destructive, especially when his teeth begin to come through and he begins to chew at everything. When the time comes, I recommend you buy him some puppy teething rings, and puppy chew toys. I'm sure you'll give your puppy lots of love and affection, and play with him, and train him, when you come home in the evenings. Your puppy will need lots of love, and will also need socializing if he is to grow up without any behavioral problems. Socializing is where you introduce (gradually) your puppy to all types of different people, (black, white, wearing caps, beards, tall, short, children) sounds, (sirens, loud bangs, fireworks, whistles) sights, (fireworks, cars, balloons, air-planes, trucks, traffic, horses, other animals) textures, (stone floors, soil, grass, plastic, glass, steel), etc. so that he won't be frightened when he encounters them as an adult dog. Please understand socialising your puppy is an extremely important part of his development. Before I go, you said that your puppy was crying and cold. You really need to keep him warm, especially during the winter time. Please make sure he has a warm blanket and site his crate, or sleeping area away from cold drafts. If he's sleeping on the floor, make sure there is something underneath his bed or sleeping area such as a piece of carpet, and please don't forget his blanket. If your puppy continues to cry, I would recommend that you take him to see a vet, just to have him checked over. Once you are certain that he's okay, then you can get on with the process of loving him and raising him. There's lots to learn about raising a puppy and if you'd like to read more about cocker spaniel puppy care, please just follow the link. Good luck and enjoy your puppy! I agree - at 10 days old he should still be with his mother. It looks like you've had some good advice there - take it and good luck! A puppy of 10 days old should be with its mother. This is far too young to be on its own. You really will have your work cut out for you!